FOR ALL THOSE TIMES YOU WANT COMFORT FOOD THAT SENDS YOU INTO YUM MODE…PICK THIS RECIPE! Don’t pass by this recipe frugal foodie fans because sweet and sour meatballs are on the menu and I’m almost certain I’ll have you wrapped around a bowl by the end of this recipe. Everyone loves meatballs unless your vegetarian and unfortunately this is a meat-lovers recipe today. One meal my family just loves including our toddler is sweet and sour meatballs over garlic fried rice. Over the years my wife and I have experimented with various kinds of meatballs but always go back to the tried and true original Nonna’s Italian meatball recipe. The great thing about having a standard meatball recipe is that you can use it as a base to add other flavours on top like we did with the sweet and sour sauce that has brown sugar, ketchup, Franks Red Hot Sauce, sweet pineapple and few other ingredients that bring together a delicious sweet yet sour coating for the meatballs. Meatballs are delicious fried or baked on their own, soaking in pasta sauce, dripping in a honey garlic glaze or coated in sweet and sour sauce. 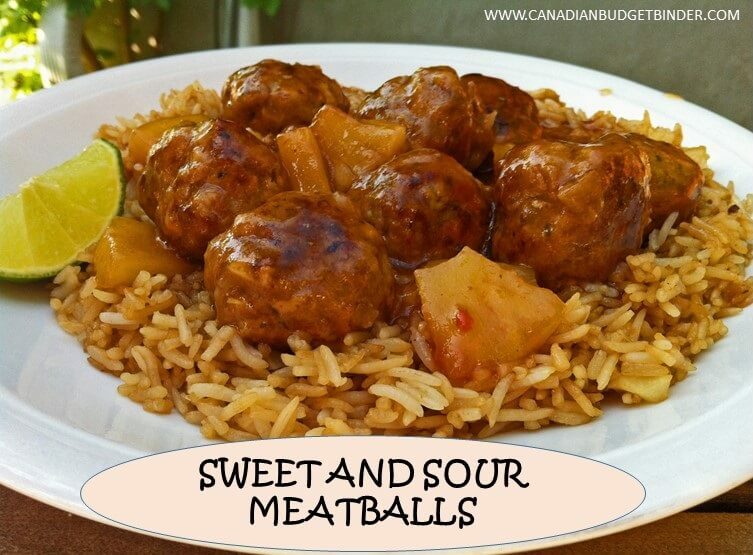 Sweet and sour meatballs are the staple party food for most gatherings especially for game day, a pot-luck, birthdays, a baptism, anniversary or garden parties. Sometimes it’s nice to just curl up on the couch with a bowl of sweet and sour meatballs watching a movie and munching on them as a snack. Meatballs are always the star of the show when added to pasta, soup or even on top of rice like we are doing today. The types of bases you create to top your meatballs are endless depending on what kind of food mood you are in. For these sweet and sour meatballs you can use any type of pasta boiled and coated with some butter and chives, cous-cous, vegetable spiral pasta such as zucchini pasta or just about any rice dish. There is a lovely pineapple rice dish from CBB fan Christine or beet leaves and rice stir-fry that would compliment the sweet and sour meatballs perfectly if you like that extra bit of sweetness. If you want to cut the sweet with a bit of savoury you can make a simple garlic ginger lime fried rice which is always a hit at our house topped with sweet and sour meatballs. One quick tip I want to share is that we try to make our meatballs ahead of time and freeze them. We pick one day in the week when we are both home and make a batch of Nonna’s meatballs and freeze them on baking sheet lined with parchment paper. Once they are frozen we freeze approximately 30 in a Ziploc bag which is perfect in the freezer for up to 3 months. When a meal comes up in our meal plan that requires meatballs all we have to do is take out what we need and defrost them. This really cuts down on the prep and cooking time on meal day. If you don’t like beef or would prefer turkey meatballs, chicken meatballs or other types of meatballs you can certainly switch them up in this recipe. If you are on a low-carb diet or looking for an induction friendly recipe for the Atkins or Keto diet the meatballs are low-carb but you need to swap out the breadcrumbs for plain ground pork rinds also called Chicharonnes. Pork rinds have no carbs and are great fillers for meatballs, meatloaf and even coating for chicken and other meats. That’s where the low-carb ends though I’m afraid as there is sugar and pineapple in the sweet and sour sauce. The sweet and sour sauce is adapted from one of our favourite chefs The Pioneer Woman-Ree Drummond although we’ve added a few little extras to suit our tastes. The best thing about this sweet and sour sauce is how it thickens up nicely and fully coats the meatballs. Make sure the meatballs are soaked in the sauce otherwise you’ll have dry patches around the meatball which doesn’t make for a pleasant eating experience. This is the one recipe your friends will be asking you for and when they do, hit PRINT below and you can share it with them or send them to Canadian Budget Binder to experience The Free Recipe Index. Start your utensils…here we go! Whether you're after an appetizer for a party or a main dish meal these sweet and sour meatballs will be a hit for all the meatball lovers on your guest list. 1.5 cup of Fresh Parmigiana Reggiano or Grana Padana Grated- Not the stuff in the jars or pre-grated please don’t use that stuff. In a large frying pan or deep skillet pot add your vinegar, brown sugar, ketchup, hot sauce, soy sauce, Worcestershire sauce, chives and 2 cups of pineapple juice and bring to a boil. With the remaining pineapple juice make a slurry with the cornstarch (make sure there are no lumps) and add it to the pan stirring to incorporate it. Add your baked or fried meatballs into the sauce and stir until sauce is thickened on medium heat and meatballs are heated through for about 8-10 minutes then add in your pineapple chunks. Mix thoroughly but don't over-mix. With a tablespoon scoop out enough to roll into uniform mini meatballs and put them on a parchment lined tray. *Note: You can now freeze them on the tray and then bag them for later use in your freezer) You can either bake the meatballs until golden brown 10-15 mins or fry them in your choice of olive oil for about 2-3 minutes a side. It may look like lots of steps above but trust me when I say this is a super easy recipe to make and if you make the meatballs ahead of time you’re really cutting down on the prep time. If you don’t fancy making your own meatballs you can buy pre-made meatballs and make the sweet and sour sauce and serve over your favourite base dish. Looks yummy and quite straight forward to make!! I’d cut back on the garlic to deal with tastes here. The meatball recipe would make a tasty meatloaf too from the looks of it too! Now to find some good sales on the meat for this. Stickers would be nice too. I’m guessing about two cans for the pineapple would give me the amount of fruit and juice needed for the sauce, or close enough to call it.